Is the 2019 Audi Q3 Back in the Rat Race? Audi, when you lend an ear to this name, you get instant Goosebumps. Not only for the sporty feel that Audi cars offer but also the innovative tech that describes the true blue story. 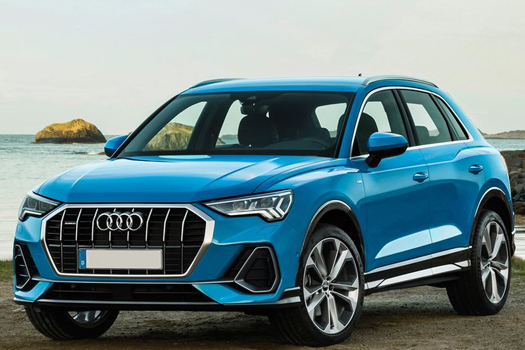 The Audi Q3 is the flagship model of this high stand brand that had its days since it was divulged, but when Audi launched the US version of Q3, it felt slightly dated. So, Audi had to unveil the second generation. Compact Crossover SUVs are in limelight these days and Audi, in order to be in the battle, launched the second generation compact Crossover a few days ago. This bad boy gets little bigger, about four inches from its forerunner. Thanks to the three inches longer wheelbase that has made Q3 more mature and technologically speaking. So, let’s get started. This big boy has all the bells and whistles in terms of styling, dimensions and technology. For its case, at 4485mm length, 1856mm width and 1585mm height, the new Q3 is 97mm longer, 25mm wider, still 5mm flatter than its predecessor. At 2680mm wheelbase, still, there’s a 77mm upsurge when weighed up with the last model that it replaces. It’s quite big as compared to its previous version giving the much more upmarket feel. The boot space is also increased, from 420- to 530-litres, be that as it may, this can be extended to 675mm by sliding the rear seats forward. It’s a crackerjack! Audi has always held in high regard for the muscular engines it makes for its cars. Same goes for the latest Q3. Specifications for the US variants are still to be announced, however, there are four power options available for British markets; a 150-horsepower 1.5-litre gas engine; a 2.0-litre 190-hp gas engine or the 230-hp version of the same engine; and a 2.0-litre diesel engine with 150-190-horsepower; all featuring 7-speed automatic gearbox. This is the area where Audi had never compromised, I mean, power pack performance on the road. Styling is fine with lots of tech inside the cabin. And on the outside, the design has become even muscular. The recent Q3 offers more family-friendly practicality and warmth than ever before. LED matrix technology is set in motion for the first time in Q3 with intelligent adaptive high-beams. Power seats, heated steering wheel, panoramic glass sunroof and dual-zone air conditioning are included as interior options. You will find more legroom, headroom and elbow room, and the rear seats of this 5-passenger Crossover can be tilted and moved forward and back, with a total of 5.9 inches of travel. The new Q3 will be sustaining the same reliability record which you can expect from any Audi. Users will be getting the advantage of dynamic handling system with six different driving modes comprising of Comfort, Dynamic, Off-Road, Efficiency, Auto and an adjustable Individual mode. Overall, handling is quite impressive, that means, the latest Q3 is off the mark in terms of handling. Alike other expensive cars made by Audi, the Q3 gets the same infotainment system. With a digital instrument cluster offering a 10.25-inch screen and 12.3-inch display optional. The dash centre is equipped with an 8.8-inch screen. Android Auto and Apple CarPlay are standard for the infotainment system on this new Audi Q3. Thanks to the Audi virtual cockpit taking right in, that means, the system displays navigation betwixt the gauges. There’s a bunch of option units on the board together with LTE connectivity, Google Earth navigation mapping, WiFi hotspot, and compatibility with the myAudi smartphone app and that’s for remote functions like auxiliary heating, locking/unlocking, vehicle status, and much more. There is an option of three interior colour variants that users can choose from and these are basic, Audi design selection and S line. There’s a lot of options of safety apparatus on the options list including the parking assist, adaptive cruise assist, traffic jam assist and active lane assist. Natural language voice control is also included in the upcoming Q3, which means, the system will ask questions and offer different way outs. Overall, the Q3 is much more improved and Audi is lying its eyes on Q3 for a blasting come back once again. What do you think then?